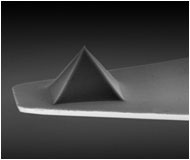 The Pyrex-Nitride probes have silicon nitride cantilevers with very low force constants and integrated oxide sharpened, pyramidal tips with a height of 3.5 µm. The tip is located 4µm behind the free end of the cantilever. This probe series features a support chip that is made of Pyrex. Two chip versions are available: The DB series with rectangular / diving board cantilevers and the TR series having triangular cantilevers. Both sides of the chip have identical cantilevers. The typical tip radius of curvature of is below 10 nm. The gold reflex coating consists of a 70 nm thick gold layer deposited on the detector side of the cantilevers which enhances the reflectance of the laser beam. 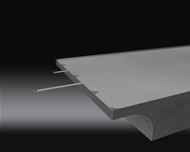 Furthermore it prevents light from interfering within the cantilever. 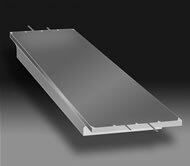 As the coating is almost stress-free the bending of the cantilevers due to stress is less than 2 degrees.